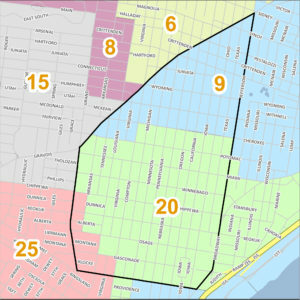 In collaboration with local elected officials, neighborhood organizations and other community stakeholders, we are facilitating a community-driven planning process for the Gravois-Jefferson Historic Neighborhoods: the area defined by Gravois on the north, Meramec on the south, Grand on the west and Jefferson on the east. We look forward to working together on the development of a shared community vision and strategies to ensure the long-term growth and vitality of the area. The shape below shows the boundary of the Gravois-Jefferson planning area (black line), as well as the wards represented in the area.